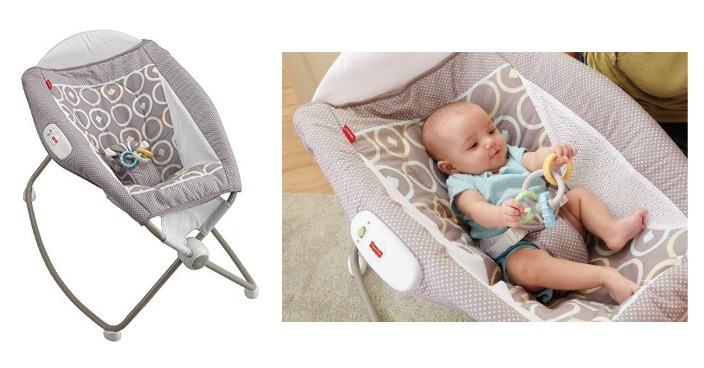 Fisher-Price Newborn Rock 'n Play Sleeper Just $36! Down From $60! You are here: Home / Great Deals / Christmas Deals / Fisher-Price Newborn Rock ‘n Play Sleeper Just $36! Down From $60! Fisher-Price Newborn Rock ‘n Play Sleeper Just $36! Down From $60! Amazon has this Fisher-Price Newborn Rock ‘n Play Sleeper on sale for $36 (Reg. $60)! It’s an inclined sleeper and playtime seat in one! An extra-deep seat with a comfy, supportive insert helps baby sleep all night long. Calming vibrations add to the soothing experience. And with a gentle push from mom, the sleeper rocks. Design is easy to assemble and light-weight for portability and storage. Additional features include a three-point restraint and linkable clacker toy. Insert is machine washable and dryer safe.